When a return is cheaper than a one-way. South America. Over the past five or ten years, the pricing strategies of most of the European and North American airlines has drastically changed. From nearly all cheap tickets being required to booked as returns, the market has shifted, allowing passengers to book as one-ways which can either be standalone, or combine-able to make a return ticket. The low-cost carriers in particular have driven this change. It does things like eliminate Saturday-night stay requirements, minimum stay periods etc. There are still some exceptions – for example only until this year, business class in Europe still retained these requirements on both the Lufthansa Group and British Airways. Now, these are bookable as one-ways too. Long-haul flights haven’t yet started to work as two one-ways, however airlines like Norwegian and TAP Air Portugal are slowly starting to change this. Both price long-haul flights as one-ways. Again, this is a good thing. There are still some aviation markets in the world where the old ways still rule, and felt it was worth highlighting from both my own experience and that of a friend, and a few tricks to help get around this. South America is still quite backward with pricing. The continent is also home to two mega-carriers, the LATAM group who are part of oneworld, and Avianca who are part of Star Alliance. SkyTeam has Aerolineas Argentineas, however they’re much smaller relative to the other two. This means that competition is much less than somewhere like Europe or North America where you have five or six major players fighting over the market. The other interesting thing is that the market hasn’t liberalised much in terms of having open skies agreements between countries. If you want to travel to a secondary city to another secondary city then you’re almost always going to need to traverse at least one capital city, or via a hub. Some countries even have residency restrictions. Argentina makes flights available for those with a resident’s card available at very low cost, compared to foreigners who have to pay a conversely high cost. Unfortunately there’s not really a way around this. Resident’s tickets can generally be bought outside Argentina (via a .AR website) however if you don’t have the right ID at check-in, you’ll be off-loaded or asked to pay the higher price. 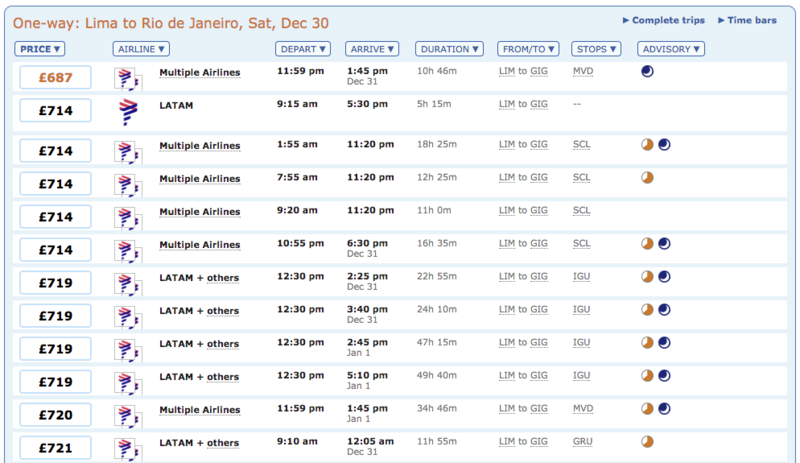 One of my friends will be in South America over Christmas and New Year and needed to get from Lima in Peru after Christmas, to Rio in Brazil in time for New Year’s Eve (yeah, I’m super jealous). That unfortunately is a one-way ticket. As you can see from ITA Matrix, those flights are expensive. Very expensive. However, in order to make it cheaper, I suggested that he add in a flight from a cheap destination back to one of the LATAM’s hub cities. In this case I suggested Mendoza in Argentina, back to Santiago in Chile. It’s a very short flight so should have competitive pricing. This is what the query looked like in ITA Matrix. Which produced substantially lower fares. He actually bought the ticket a few days ago, and so managed to get it into an even lower fare bucket than the ones here, for a total price of £334. I’ve made use of this strategy myself on a few occasions in South America with domestic flights in Chile. 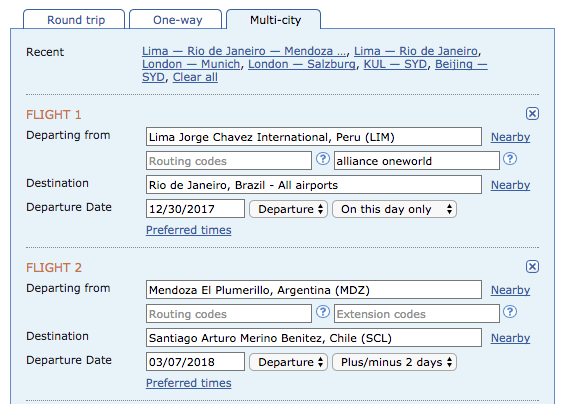 For example, I need a one-way ticket from Calama in Northern Chile down to Santiago, in order to connect to an existing ticket back to the US booked using Avios. However it was over 50% cheaper to book this return flight. I purposely made sure to pick a date a few weeks ahead that I knew would be cheap – note that it books into ‘O’ class, one of the lowest available. Finally, I want to point out one more way of getting lower priced tickets, and that’s the Visit pass from oneworld. Star Alliance used to have a similar product (albeit not for South America) however discontinued it this year. The Visit passes can be useful, however are a bit of a pain to book as they require a travel agent. They also require you to have a confirmed flight to/from the region on a oneworld carrier (although all that is needed in reality is an e-ticket number inserted into the booking). Finally, they do book into the lower booking classes, so may not be available on the various days you need. 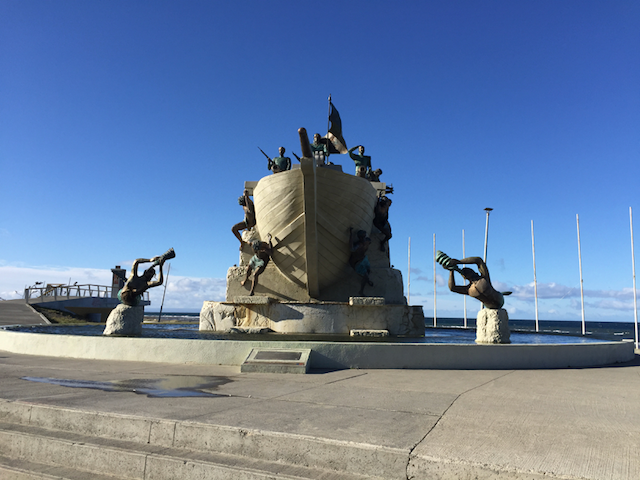 So in summary, travelling via multiple countries in South America takes a little more planning and though to get the best fares, compared to North America or Europe. However there are deals to be had, provided you know what to look for. Previous Post: Swiss and Lufthansa First Class deals ex-UK. Next Post: Airbus and Bombardier Partnership.